Mumbai and Hyderabad, St+art India Foundation, which is associated with the public art movement in India, took up the public art beautification project of Panjim during the Serendipity Arts Festival (SAF) 2017. St+art India Foundation is an organisation formed on the principle of ‘Art for All’ and works on art projects in public spaces. The foundation aims to make art accessible to a wider audience by taking it out of the conventional gallery space and embedding it within the cities we live in - making art truly democratic and for everyone. St+art India Foundation in association with Asian Paints aimed to look at Panjim from individual perspectives of different creative personalities and their combined effect when all of them were revealed in the urban landscape. Simultaneously, the Goan perspective is brought out up front. The public art project aims to discover a side of Goa by putting the focus on Goan culture out on the streets for the locals and the tourists visiting the state of Goa. “The landscape of Panjim is very different from rest of the cities in India. 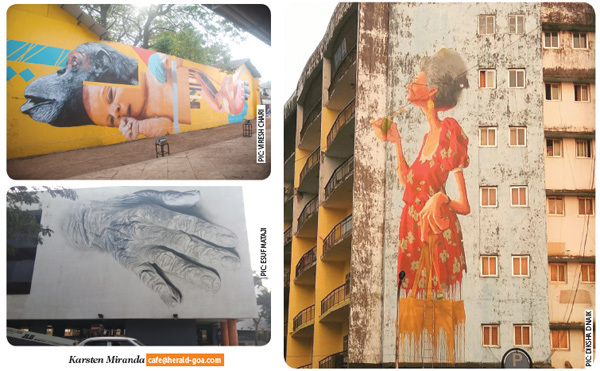 St+art Goa has various projects which delved into the character of the city instead of just painting ‘walls’. We have been very careful with the kind of content we are putting in public space. We hope to bring the art alive every year with the Serendipity Arts Festival,” says Hanif Kureshi, curator of St+art Goa. Inspired by the larger than life cutout poster culture in Tamil Nadu and neighbouring states, St+art envisioned a series of portraits of local Goan people spread across Goa - greeting people on their way from the airport to the city. The idea was to celebrate local Goan personalities through a medium which was only restricted to famous personalities. These 40ft high cutouts have been painted by Bollywood poster artists from Mumbai. Celebrated at one point, these artists have lost their livelihood with the arrival of digital printing. Additionally, India and international muralists were in Goa to paint large size murals and explore their version of Goa. Parag Sonaghare (India), Guido van Helten (Australia) and Curiot & Romina Romanelli (Latin American duo) Do+Khatra (India) are some of the artists who were invited to create these murals. Proverbs are words of wisdom, passed through generations. Mindful of the increasing communication gap between the young and old generation, St+art had invited sign painting artists, to work on a series of proverbs from Goa, translating them into vibrant art pieces to engage the audience. The team at at St+art got an opportunity to use closed shutters as canvases for proverbs. The proverb project offers a two-way opportunity to generate curiosity and initiate dialogue among the young and old; as also revive sign painting as an artform. As part of SAF 2017, St+art also invited graphic designers to interpret their version of Goa, which was spread across the city as A4 sized posters. The A4 Art Project started as a satirical protest against ‘A4 vandalism’ - something which has been a part of our urban landscape. Various graphic artists were invited to participate in the project. St+art also filled the city with guerrilla projections across the city. The objective was to travel with portable machinery to map video movies, artworks, texts, graffiti, etc on idle building facades as a sort of projection bombing. Turning buildings into screens for relevant messages or visuals on spots that are otherwise out of reach, a visually powerful action that will bring art to shine in the night. For the same, Tue Busride studio has collaborated with underground artist DAKU to explore the possibilities of this new media medium which is extremely effective in the way in which it reaches and surprises the audience.